One thing’s for sure, there’s probably going to be a Quora for every possible niche eventually. The Q&A site meets social network concept is just a great way to spur the creation of good quality content. A Quora for the enterprise, Opzi, did well at TechCrunch Disrupt: San Francisco this year, for example. And there are other examples as well. We’ll see more soon. Starting now. 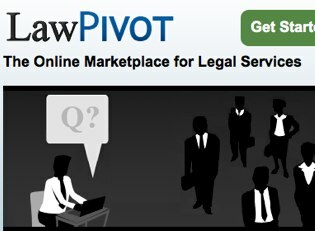 LawPivot is a self described “Quora for legal” that allows technology companies to confidentially ask legal questions to expert attorneys. The founders/execs are all attorneys with tech experience: CEO Jay Mandal was formerly a lead mergers and acquisitions attorney at Apple, cofounder Nitin Gupta was previously an intellectual property litigation lawyer and VP Engineering Steven Kam is a software engineer and architect with experience as an intellectual property litigation lawyer. Three men who, like myself, fled the law. They’ve just stayed a little closer to the tree than I have. The company has just raised a $400,000 angel round and has expanded to six employees. Investors include David Austin, Allen Morgan, Deep Nishar, Nishith Desai and Chris Yeh. For now the site is free for both companies and attorneys. Eventually, says cofounder Gupta, they’ll begin to charge companies either a monthly or per question fee. And eventually, of course, the LawPivot can charge lawyers as well for surfacing new clients to them. LawPivot is a great resource for startups, particularly young startups without their own established attorney relationships. Questions are answered confidentially by multiple lawyers. Questions are completely confidential. Attorneys answer without seeing the answers of other attorneys. On the downside none of this content is publicly available, so there’s no SEO opportunity for the company. That means people have to find out about LawPivot more by word of mouth than through shared links and search engines. Still, It’s something I’d use. I imagine a lot of startups will.